OTTAWA, ONTARIO — Bank Street has to be one of Ottawa’s most interesting streets. It starts in the north at the Parliament Buildings, the city’s top billing. Forget the staid, conservative image that politics brings to this town as you make your way south to the business area — it isn’t called Bank Street for nothing, with cool coffee shops, retro stores, even massage parlours now in refurbished buildings. Then follow the organic groceries, alternative lifestyle shops and — at the intersection of Bank and Somerset — the city’s gay village. Pass under the Queensway, a highway intersecting the city, and you surface onto the toney Glebe neighborhood where well-off locals come for coffee, a meal or for shopping. But on the occasional summer or fall night the area is ignited by the presence of football fans. CFL football, man, it’s as Canadian as maple syrup and polar bears. And in Ottawa, hearing, “There is a football game tonight at Lansdowne” was a time-honoured expression not heard for long time. The hibernation occurred because the Ottawa Rough Riders folded in 1996 only to be followed by the short-lived Ottawa Renegades from 2001 to 2006. But you’d never know that football went on vacation for nine years when attending a RedBlacks game. The team played its first season in 2014 and season two for them starts next month, with the first home game scheduled for July 4. 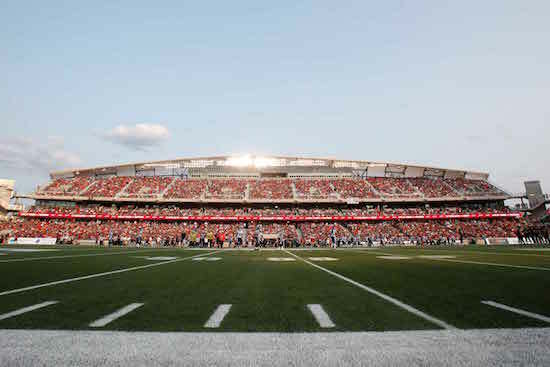 Despite only winning two of 18 games in 2014, fans were boisterous and every game at the TD Place stadium at Lansdowne Park was a sellout. Canada Post has even issued a stamp for the RedBlacks, featuring legendary Ottawa quarterback Russ Jackson. On game nights football fans take over the Glebe area as they make their way by bus or on foot to Lansdowne Park. The uniforms, hats, T-shirts and pennants are popular souvenirs. 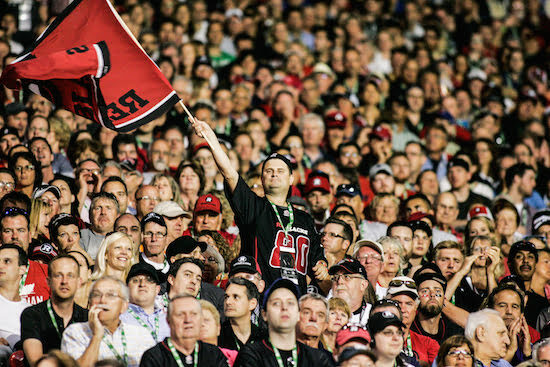 The true fans are decked out in RedBlacks finery and sit prominently in full view on the game’s many pub terraces well before game time. When I last attend a game, it was a beautiful Friday night in unseasonably warm weather. Lansdowne Park’s stadium has always enjoyed a fabulous location. The south side of TD Place overlooks Ottawa’s Rideau Canal and was recently renovated to include an attractive wood structure shell. Behind the north side is the heritage Aberdeen Pavilion that has had many uses over the years. During the night of my visit, it was the locale for an indoor tailgate party. When construction in the area finishes, some condo owners will have fabulous end-zone views of the games. This whole area will become a urban village with condos, stores and restaurants. Right in the middle will be the football stadium and junior hockey arena. The statue of legendary coach Frank Clair, manager and general manager for five Grey Cup championship teams, graces one area, a reminder of when the stadium was named after a great student of football, and not a bank. Not enough to beat Montreal, though. 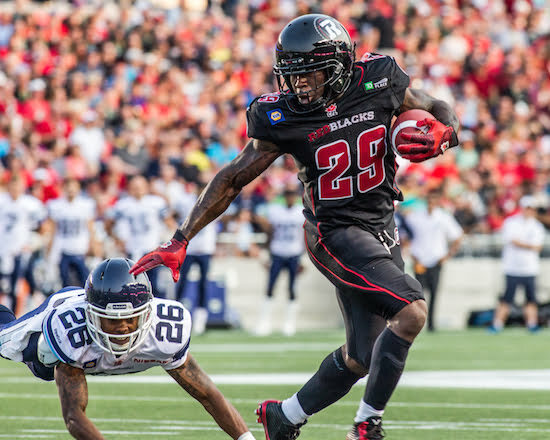 In a game in which the RedBlacks had more first downs, passing yards, completed passes and time of possession, the Alouettes still came away victorious, thanks to a fumble that was returned for a touchdown. Still, the fans were in a good mood. The atmosphere in the stands continued down Bank Street after the game. Ottawa Valley micro-brewing houses keep the innumerable sports bars well stocked with brews and the fans pour into establishments for many pints. After a drink on Bank Street, we took the free bus back into the downtown area. (Ticket holders to events at TD Place ride the transit system for free when they show their proof of purchase.) The party continues in the Byward Market, Ottawa’s most well-known and boisterous area. If you come later in the season, you will notice as you walk down Bank Street through the Glebe that the fall colours hit Ottawa like an unrolled carpet. After the first frost the leaves change colour and a riotous display of red and yellow is created. 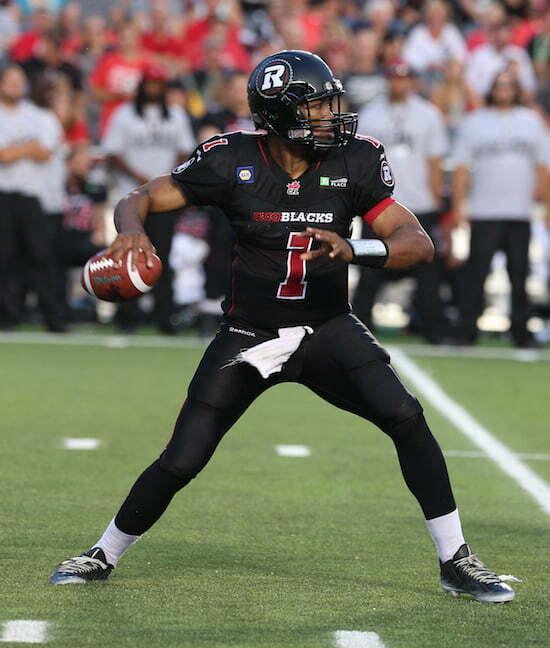 Ardent fans of the RedBlacks hope that when the leaves turn this year that it won’t also herald a sudden end to the season. Now that the team is back, making the playoffs and winning a championship is the next wish to be fulfilled. Tickets: Home-opener tickets on July 4 range from $90-$354. Tickets for the eight other home games go on sale on June 1. Real Sports Bar and Grill (90 George Street) — features 99 screens, one big enough to make the place look like an indoor drive in as it measures over 27 feet wide. The Arrow and the Loon Pub (99 5th Avenue, at corner of Bank Street) — serves a range of poutine, as well as burgers, pizzas and wraps. Irene’s Pub (885 Bank Street) — one of the closest bars to the stadium, Irene’s also features live music and has a whisky menu. Pints and Quarts (779 Bank Street) — serves decent British-style pub fare. Rosie’s Southern Kitchen (889 Bank Street) — Higher-end dining, with entree-sized menu options ranging from $21-$45.